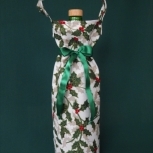 Cotton fabric body, lining and handle. Polysatin security ties. 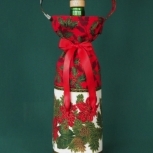 This Festive Bottle sleeve features a white with holly berries upper body and a band of red poinsettias around the bottom. 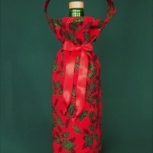 Install a gourmet bottle of olive oil, fancy vinegar or jar of pickles as a wonderful gift for your fabulous foodie friend. 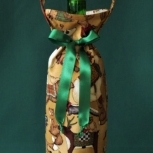 Bottle sleeves are fully lined with a round, form fitting bottom. 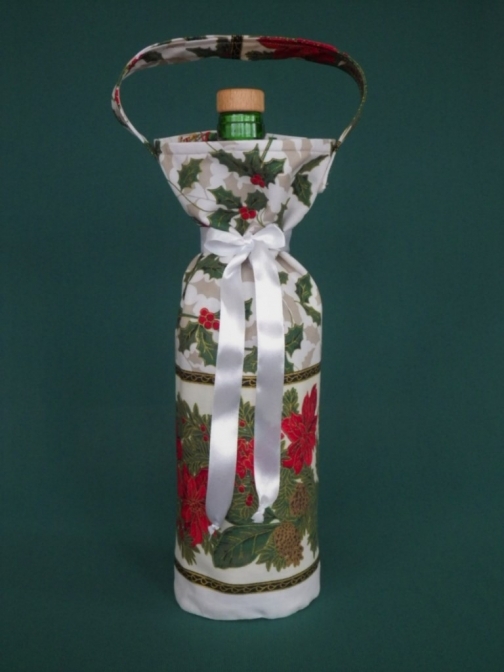 Also, you can insert a quality bottle of wine as a standout gift for the hosts of your next dinner party. Encourage a tradition of re-gifting these sleeves. They are washable by hand and will last for many dinner parties to come. As a thoughtful gift for the person in your life who likes to take a long relaxing soak, you can tie in a luxury bottle of bath salts or bubble bath or scented bath oil. The height stated does not include the handle. Bottle shown is not included. Item ships from: Brisco, BC, Canada. $8.00 CAD ($2.00 CAD when combined with another item) by Canada Post. $5.00 CAD ($1.00 CAD when combined with another item) by Canada Post. Shipping schedule is Tuesday and Friday mornings. Deadline for shipping is the midnight before the scheduled shipping date. Seller will not be held responsible in any way for Customs, Import or Duty fees or for delays caused by Customs or disruptions in mail service. All items shipped via Canada Post only. Buyer can return item within 14 days of receipt for monetary refund if unsatisfied for any reason. Seller will pay for return shipping.